With the phasing out of Methyl Bromide and the drawbacks of alternatives such as Sulphuryl fluoride and Phosphine, heat treatment for pest control has emerged as one of the most promising new insect pest treatments for some time. Thermokil Ltd is able to offer heat treatment equipment for pest control treatments of mill, bakery and other food production machinery as well as empty silos, small rooms or sections of buildings. Successful treatments of whole buildings are now becoming more accepted. The current techniques for heat treatment for bed bugs were pioneered by Thermokil. Heat treatment for bed bug control in difficult to treat bedroom furniture has proven very successful. The key to successful heat treatment is the understanding of how heat distribution occurs in different situations, and the management of our heat resources to maximise efficiency and eliminate potentially damaging situations, which have occurred with some other heat treatment technologies in Europe and particularly in the USA. Thermokil scientists have been running commercial and research treatments since 1998 and we can confidently say that we are the global market leaders. David Hammond Managing Director Thermokil Ltd.
Dave Hammond graduated from Leeds University with a degree in Zoology, from where he joined Rentokil in 1982. He rose through the ranks to be Technical Manager North of England and finally National Fumigation Manager. A specialist in the control of Stored Product Insects (SPI) in flour mills and bakeries, he then founded Igrox's Pest & Hygiene Management Division. 5 years later David left Igrox to develop his ideas for organic pest control techniques and heat treatment, also working as a pest control consultant around the world including in New Zealand, Australia, Israel and Romania. With Thermokil David has successfully introduced new heat treatment technology and ideas into the UK and campaigned for the elimination of the ozone depleting gas methyl bromide and other dangerous pesticides. Ryan Overton Director Thermokil Insect Control Services Ltd.
Ryan Overton is our Director for Thermokil Insect Control Services Ltd. Graduated with honours in Business Studies from De Montfort University and has 7 years experience alongside David Hammond carrying out heat treatments across food, residential and leisure sectors. Now operations manager overseeing projects with heat treatments across all aspects of pest control. Previously with Dawsons Rentals, Ryan has worked on heat treatment projects with Thermokil over the last 5 years before joining full time in November 2011. Ryan is responsible for UK service operations, particularly our associations with an increasing number of UK pest control companies. Jim Morgan is our Engineering consultant responsible for building Thermokil kilns and Fumigation chambers and for trouble shooting technical and engineering issues and special projects. Mike Russell is the Thermokil company secretary. Jerome Scharff is the Thermokil representative in France and low countries. March 19th 2010 marks the first day of a new methyl bromide free Europe. As usual, despite many years of notice, the event will catch many by surprise. Sulphuryl Fluoride was at one stage thought to be a promising replacement, but it is an incredibly toxic and dangerous gas and not as effective at killing all life stages of insects as methyl bromide, whilst being more effective and dangerous at killing mammals - namely humans. Methyl bromide is strongly linked with depletion of the ozone layer, and as such we cannot afford to take chances - not with the planet. It is totally right that the world stop using this material. We cannot understand why some countries are dragging their feet over its withdrawal, I suspect heavy lobbying from industry of the kind that went on in the UK may have something to do with it. On the plus side there are technical solutions to all of the so called problems that arise from the withdrawal of this fumigant, but the first obstacle is the mindset of industry. As a past National Fumigation Manager at Rentokil and having spent 5 years at Igrox and seen fumigations in progress in numerous countries around the world, I was constantly amazed that more people haven't been killed by fumigation. This is in addition to quite a few of my former fumigation colleagues and friends I know of who have died of brain tumours or other cancers, which I attribute to their work exposure to pesticides and fumigants. In the last year we have buried my good friend Vic Mathews of Precision Pest Management and Del Norton who took over from me as National Fumigation Manager for Rentokil, both from cancer in their early 50's. The practice of fumigating commodities with methyl bromide under sheets in enclosed warehouses, and allowing people to work in the same building was I think particularly potentially hazardous. In practice, nobody hung around to take gas readings in the working environment, a quick check for obvious leaks and patch the sheets up with tape was the best one could expect. I for one am happier that practice has finished. Whilst working in New Zealand in the late 1990's I noticed the way in which they used pesticides was appalling - clients would pay not by results, but by the amount of pesticide that was applied, and so the more you used the greater your profit. I also noted in a eight week period an apparantly much greater incidence of cancers amongst people I met compared to the UK. At the time I knew of only 3 or 4 people in the UK whom I was aquainted with who had endured cancer. In just 8 weeks in New Zealand I came across 20 people who had either had cancer themselves or their relative had died of it. After coming across 5 incidences in my first week, I then interviewed the next 15, and all of them had been exposed to pesticides in either the Kiwi fruit industry, or paper/timber industries or in normal pest control. We then had the Dow incidents and enquiry re their New Plymouth pesticide plant in New Zealand which had alot of media cover out there - although it was supressed in the UK. This awareness of the hidden dangers of pesticides drove me to look into the feasibility of heat treatment in the mid 1990's as an alternative to methyl bromide, and a conviction that pro-active pest prevention is always better than reactive pest control. 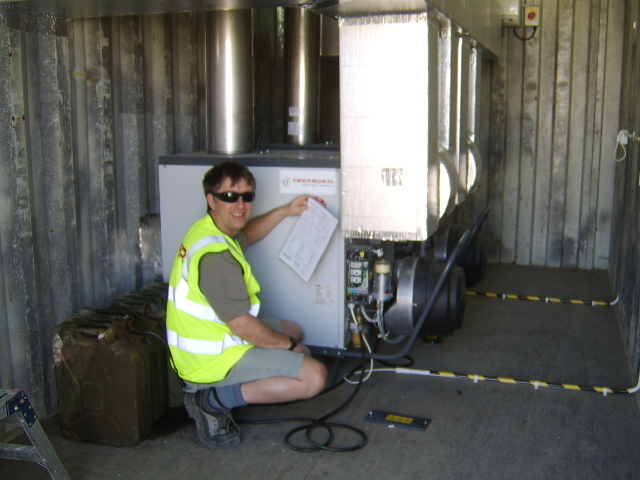 By 1999 we had the basic principles of mobile heat treatment sorted and the rest as they say is history. Meetings with MAF in New Zealand and AQIS in Australia, both in Canberra and in Sydney kept them abreast of our technical developments, and I'm sure must have helped contribute in some small way to the acceptance of heat treatment for ISPM 15. The final and major contribution made by Thermokil Ltd was the introduction of cheap and affordable heat treatment kilns with our container conversions. No longer could the supporters of methyl bromide claim it that alternatives were more expensive, and for timber, heat treatment is far more effective, quicker, cheaper and safer than using toxic gases. I am convinced, just from what I know, that practicable alternative treatment strategies exist for almost every situation. Some require planning in advance and anticipation of potential problems, but this handicap should be viewed as an oportunity to handicap cowboys in industry, as it will reward good management and forward thinking. The latest issue is the treatment of full containers to ISPM 15 specification. After 5 years or so of ISPM 15 as we know it, I cannot believe that people still even load untreated and unmarked pallets or packaging into a container for export. You would think the exporters and carriers would make people aware of this - but no, it seems there is a demand by docks for these emergency dockyard treatments. We are on the case and are trialing some ideas - but the real answer is... get pallets and packaging treated before you load up- its so much simpler, easier and cheaper for all concerned! Finally, and returning to a serious theme - A comparatively large number of my former work colleagues and friends have died of brain tumours, but we have no formal data on the issue. I am loath to go raking over families past memories, good or bad without good reason. If people would like to volunteer any information to me in confidence, we can possible help identify whether or not there is a link between methyl bromide or other chemicals commonly used by fumigators and brain tumours in particular. Our recognized customers, associates and international partners trained in the Thermokil techniques are listed below. For more information and contacts please do not hesitate to contact us.